On a recent trip to Rome, Italy, with Barone Fini Wines, I'm proud to say that I was the enthusiastic consumer of four pasta dishes (and an unmentionable amount of wine) in two short days: two carbonaras, a classic cacio e pepe, and conchiglie pasta in a red all'Amatriciana sauce. But unlike my pasta binges stateside (there are plenty), I wasn't left in physical pain after polishing off my second bowl of creamy, pancetta-flecked carbonara on Sunday evening (made from scratch by Barone Fini Wines President Giovanni Bonmartini-Fini and family). This was partly due to the fact that the reasonable portion sizes didn't allow for overeating—which was something to get used to in and of itself. Pasta is considered a first course, or "primo," in Italy, which is then followed by a "secondo," which typically consists of a little meat, fish, or cheese, and vegetables or salad. In other words, pasta is not the main event, and the portion sizes reflect that. 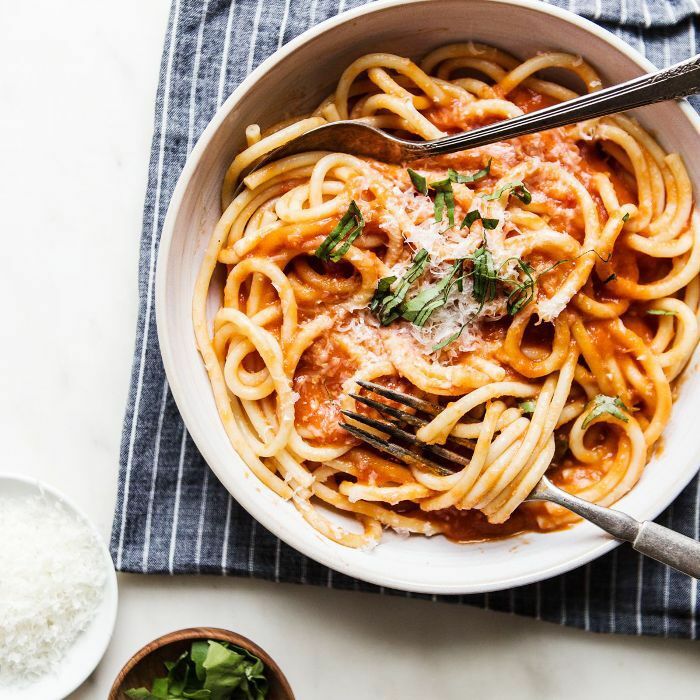 "From my experience traveling the U.S. and Italy, the portions of pasta in the U.S. are much larger," Bonmartini-Fini, a native Roman, told MyDomaine. "A typical portion of al dente pasta [in Italy] is around 100 grams," or roughly half a cup of pasta before boiling. The pasta dishes I ate in Rome also gave a whole new meaning to the term al dente, which means "to the tooth" in Italian. The texture was much firmer and chewier than what I was used to in the states, a far cry from the overcooked penne alla vodka I've been known to impulsively order via Seamless. I soon learned that this was a very intentional culinary decision. "Al dente pasta is much healthier, less fattening, and most importantly, better tasting," Bonmartini-Fini mentioned during dinner and again over email. "The less time you cook pasta, the longer it takes to digest. Or in medical terms, al dente pasta has a lower glycemic index than well-cooked pasta. It requires greater energy to digest. The more al dente you can handle, the better." The glycemic index is a value assigned to foods based on how slowly or quickly they cause increases in blood glucose levels. Foods high on the index are more likely to cause unhealthy spikes in your blood glucose and insulin levels, while foods low on the index produce small fluctuations. Pasta ranks "remarkably low" on the 100-point GI, clocking in between 30 and 60, depending on the type of pasta, reports Live Science. "Compare this with two staples of the American diet: white bread, with a GI of about 75; and potatoes, with a GI of about 80." Francesco Pantò, director of product development at the Barilla Group in Parma, Italy, seconds Bonmartini-Fini's thoughts on al dente pasta. "Pasta should be cooked al dente, or slightly firm," he told the science publication. "Anything longer slightly raises the GI. Pasta becomes unhealthy when it is overly processed, such as the mushy stuff in a can or when it is topped excessively with fatty meats and cheeses." It's also worth mentioning that pasta is made from durum wheat, which is a "wholly different species from bread wheat, in that it contains a third fewer chromosomes," the publication adds. "Pasta is and has long been a healthy carbohydrate and a central component of the Mediterranean diet, broadly considered one of the best lifestyle diets for maintaining a healthy weight." Aside from being mindful of portion sizes and always cooking pasta al dente, Bonmartini-Fini recommends using a high-quality pasta brand, like De Cecco. Finally, the sauce ingredients are just as important as the pasta itself. "Always make the pasta sauce fresh with healthy, simple ingredients that do not get overcooked," he concludes. Fresh tomatoes, basil, garlic, and a high-quality olive oil is a good place to start. "Use a small amount of sauce. In Italy, the amount of sauce on pasta is far less than in the U.S." As far as wine goes, the Barone Fini Pinot Grigio and Merlot were both in constant rotation.